While I’m on vacation this week, I’m turning my opening essay over to a dear friend who answered my call for help. I despaired when she moved to France last year because she is one of my favorite cooking buddies. Now I look forward to her Facebook updates and photos of her garden, cooking and dinners in local cafes. Tony and I can’t wait to visit. 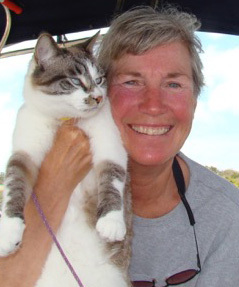 About a year ago I packed up and, from Ohio, moved me, my dog and cat and “stuff” to a 400-year-old house in a tiny (600 souls) village on the Canal du Midi in the Languedoc region of southern France. My adjustment to the new surroundings has not been without angst but a trip to the local Tuesday market could pretty well iron out any foodie’s rough times! My best summer dish is just barely a “recipe”. The glut of summer veggies requires that I make a pot of ratatouille about once a week. It has the benefits of being inexpensive, low in calories and easy to make — my kinda dish! I pretty much use what I have, but eggplant (aubergine) is essential for me, along with zucchini (courgette), red bell pepper (poivron rouge), tomato, sweet onion, garlic and basil by the handful. I’m generous with the olive oil in which I begin to sauté all of these chunked-up vegetables, and then invariably add some more olive oil at the end and/or when I serve it. The olive oil melds the flavors and adds a bit of its own. It is crucial. The proportions are mostly a matter of how much of each vegetable I have, although the amounts of eggplant, zucchini, red pepper and tomato should be relatively the same proportionately. I use a little less onion and for one pot of ratatouille (3 to 4 quarts), three or four good-sized cloves of garlic, mashed and chopped, is enough. You can mix the vegetables according to what pleases your palate, though. Sauté the onion and garlic first then add the other veggies and cook them till they give up their juices and the juices cook away a bit (about 35 minutes or so) then add the basil and let it wilt in the pot. I use Greek basil with small leaves but if sweet Genoese basil is all I have I chop it just before adding it…and it is done! For grins, I add just enough hot red pepper (cayenne or esplette) to make the flavor interesting, but not spicy. 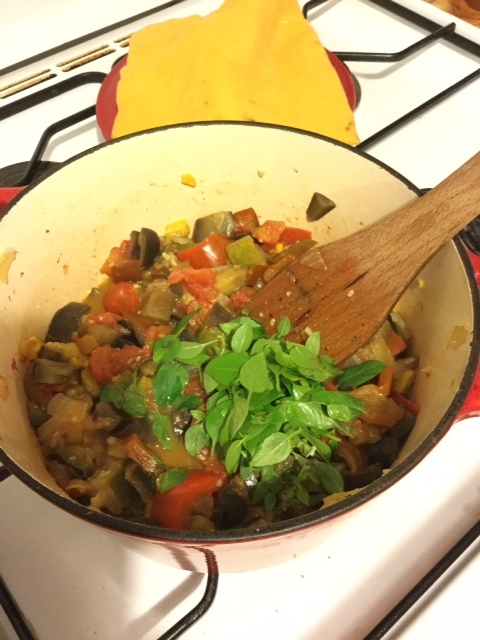 I can serve ratatouille as a main course (ever entertain a vegetarian? ), hot like a stew or room temperature as a side dish with some grilled meat, or cold for a first course. Often, whatever the temperature, I put a blop of yogurt or créme fraiche on each serving (it’s pretty) and olive oil (it’s good for you). Heat the olive oil in a 3- or 4-quart heavy, non-reactive pot. Sauté garlic and onion until softened. Add eggplant, bell pepper, zucchini and tomatoes. Add the vinegar and season with salt and pepper. Cook, stirring occasionally, for about 35 minutes or until the vegetables give up their juices and most of the juices evaporate. Stir in basil and cayenne to taste and cook until the basil wilts. Spoon out portions and top with a blob of yogurt or crème fraiche, if desired. May be served warm or cold, as a first course, main dish or side dish. When the temperature hits 90 – or even 80 – you probably think twice about turning on the stove. The irony is that summer is when vegetables are plentiful and most delicious. If you want to save some for the winter ahead, you must blanch vegetables to protect the color and texture. But instead of dealing with a steaming pot, you can blanch them in the microwave. Place 4 cups of sliced or cut vegetables in an 8-cup microwave-safe bowl or casserole. Add 14 cup of water and cover with plastic wrap, venting one corner or edge. Microwave on high power just until the color of the vegetables brighten. Immediately plunge into ice water to stop the cooking process, then drain well and pack in freezer bags. A recipe for the Crack Pie that is served at Momofuku’s Milk Bar (in New York City) showed up in my Pinterest feed no less than 10 times in 2 days. I had to see what all of the fuss was about. Apparently, Crack Pie was devised by David Chang’s pastry chef, Christina Tosi. I plan on making the pie sometime in the near future and I was wondering if you had tried it, or any of the other desserts? In case you haven’t, here’s the recipe. Please share your thoughts. Dear Michele: My thoughts: Yeow. There’s so much sugar and butter in the recipe that my teeth ache just reading about it. If I hadn’t given up sugar – kinda – I would try it. Tosi is the new judge on Gordon Ramsey’s “Master Chef,” replacing sourpuss Joe Bastianich. Although Tosi isn’t exactly little miss sunshine on the program, she is mostly pleasant. I’ve wondered about the kinds of desserts she makes, so thanks for sharing. For the Oat Cookie crust, preheat the oven to 350 degrees. In a stand mixer with a paddle attachment, cream butter and sugars on medium-high for 2 to 3 minutes until fluffy and pale yellow in color. Scrape down the sides of the mixing bowl with a spatula. On a lower speed, add the egg to incorporate. Increase the speed back up to a medium-high for 1 to 2 minutes until the sugar granules fully dissolve and the mixture is a pale white color. On a lower speed, add the flour, oats, baking powder, baking soda, and salt. Mix 60 to 75 seconds until your dough comes together and all remnants of dry ingredients have incorporated. Your dough will still be a slightly fluffy, fatty mixture in comparison to your average cookie dough. Scrape down the sides of the mixing bowl with a spatula. Pam spray and line a quarter-sheet pan with parchment or a Silpat. Plop the oat cookie dough in the center of the pan and with a spatula, spread it out until it is 1/4-inch thick. The dough won’t end up covering the entire pan, this is okay. Bake the oat cookie for 15 minutes. Cool completely before using in the pie recipe. For the pie filling, mix the dry ingredients for the filling using a stand mixer with a paddle attachment on low speed. Be sure to keep your mixer on low speed during the entire process of preparing the filling; if you try to mix on any higher than a low speed, you will incorporate too much air in the following steps and your pie will not be dense and gooey – the essence of the crack pie. Add the melted butter and mix until all the dry ingredients are moist. Add the heavy cream and vanilla and mix until the white from the cream has completely disappeared into the mixture. Scrape down the sides of the bowl with a spatula. Add the egg yolks, mixing just to combine. Be careful not to aerate the mixture. Use the filling immediately. To assemble the pies, preheat the oven to 350 degrees. Put the oat cookie, brown sugar and salt in the food processor and pulse it on and off until the cookie is broken down into a wet sand. (If you don’t have a food processor, crumble the oat cookie diligently with your hands.) Transfer the cookie crumbs to a bowl and, with your hands, knead the butter and ground cookie mixture until the mixture is moist enough to knead into a ball. If it is not moist enough to do so, gently melt an additional 1 to 1 1/2 tablespoons of butter and knead it into the oat crust mixture. Divide the oat crust mixture in half and place half in each of two 10-inch pie tins. Using your fingers and the palm of your hand, press the oat cookie crust firmly and evenly over bottom and up sides. Use the pie shells immediately or, wrapped well in plastic, store at room temperature for up to 5 days or in the fridge for up to 2 weeks. Place both pie shells on a sheet pan. Fill each with half of the crack pie filling (the filling should fill the crusts 3/4 full) and bake at 350 degrees for 15 minutes. During this time, the crack pie will still be very jiggly, but should become golden brown on top. At 15 minutes, open the oven door and reduce the baking temperature to 325 degrees. Depending on your oven this will take 5 to 10 minutes – keep the pies in the oven during this process. When the oven temperature reads 325 degrees, close the door and finish baking the pies for 5 minutes. After 5 minutes, the pies should still be jiggly in the bull’s eye centers, but not in the outer center circle. If the pies are still too jiggly, leave them in the oven an additional 5 minutes. Gently remove the baked pies from the oven and transfer to a rack to cool at room temperature. You can speed up the cooling process by transferring the pies to the fridge or freezer if you’re in a hurry. Freeze your pie for as little as 3 hours or up to overnight to condense the filling for a dense final product – the signature of a perfectly executed Crack Pie. Just before serving dust with confectioners’ sugar.